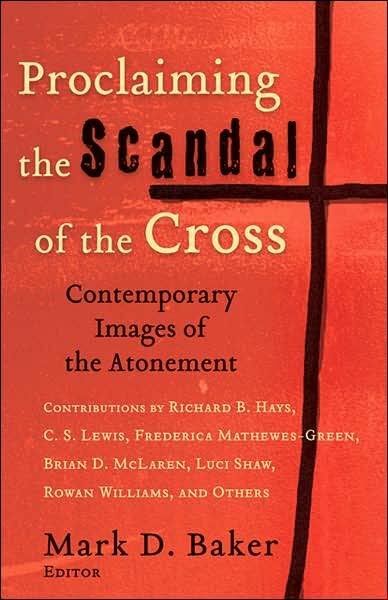 Proclaiming the Scandal of the Cross brings the reader word and prose "images" of the atonement of Jesus Christ. The book features eighteen authors all told with a tailpiece, a headpiece and one in the center by editor Mark D. Baker. Contributors include big names like C.S. Lewis and Rowan Williams though sadly, only a scant four women. Brief bios in the front of the book show they're mostly Western Protestants, mostly pastors from English-speaking countries. Sadly surprising is the apparent total omission of anyone from a Lutheran or a Roman Catholic perspective, although I especially appreciate the inclusion of Frederica Mathewes Green, who writes from the Antiochian Orthodox tradition. I found this book to be a helpful resource that I read very quickly. Despite my background, I've been known to get seriously bogged down in densely-written theological tomes - not to say those weren't written well - but this wasn't one of those. I especially like the real-life stories that contextualize each concept and the way each author nuances their atonement concepts a little differently. Each discrete chapter opens with introductory explanations and concludes with a descriptive wrapup of the material just presented. Proclaiming the Scandal of the Cross goes beyond the generally popularly acknowledged models of the atonement of Jesus Christ that typically include conflict/victory, legal penal satisfaction, and moral influence/example. In his intro, Mark Baker observes [page 31] "...for centuries, Christians preached and taught the message of Christianity without the gospel leading them to the inescapable conclusion of penal satisfaction." And, "It is noteworthy that Orthodox Christians still read their Bibles without finding this theory." [page 35, still in Baker's intro] "Through the lens of a Western legal system, anyone is just who meets the standard of the law. But a Hebraic understanding of justice is more relational: anyone is just who keeps one's covenants and commitments to others. Here, we could say that God is considered just ... because God is faithful to his covenantal promise to provide salvation to Israel and through Israel to the world." page 97 "If the apostle Paul had turned this passage in to me as a short theological reflection paper, I would have told him, 'Get thee to the writing tutor.'" ... "so that he can pass my course on Greek Exegesis of Romans." page 99 "But the Adam-Christ analogy should [page 100] never mislead us into thinking that Jesus Christ merely undoes the effects of Adam's transgression and puts us back at square one with a blank slate. Instead, Jesus has swept us into a new creation in which our identity is now positively redefined by his faithfulness rather than by our own disloyalty to God." [page 100 continued] "Paul almost never talks about 'forgiveness of sins,' because ... he has a more radical diagnosis of the human predicament and a more radical vision of the new creation. We need far more than forgiveness or judicial acquittal. We need to be changed. [page 101] We are saved because we participate in the new humanity that Jesus, the faithful, obedient one inaugurated. ... this faithfulness not only models a different pattern of life but also actually creates a new kind of family." chapter 3, "Rising Victorious" by Frederica Mathewes Green clearly and concisely defines the Christus Victor atonement model that remains most prominent in the Eastern Churches. Doug Frank, in chapter 12, "Naked but Unashamed" lines out an account both psychological and told in the first person as he describes how the cross obliterates the shame, the fears about self-revelation and the self-alienation most of us feel far too often. [page 133] "...since God is so wildly and scandalously for us, who, including ourselves, can possibly be against us?" Historically, obliteration of shame in the cross of Jesus Christ has been a focus of liberation theology, and I appreciated Doug Frank's very real-life contemporary middle-class western world examples. In another chapter (14) about shame, this one by Mike McNichols, "Jesus, the Ultimate Outsider" on page 147 quotes Dr. Ray Anderson's definition of shame as "...the perceived loss of our place with others. Those who have the power to create our history have the power to make us feel worthy or unworthy at the core of our being. ... We feel shame as loss of being." [page 149] McNichols describes when "Jesus himself became the ultimate outsider. ...He was banished from the world of homes, family and friends, work and play." Chapter 11, "The Cross as Prophetic Action" by Brian D. McLaren brings us Hosea 2; and on page 115 he calls the desert "a place of aloneness, trials, and reconstruction" and says "The Valley of Achor, the Valley of Trouble, ... will become a passageway to hope." [page 116] "[Israel] was already his [God's], but he bought her back anyway." McLaren contrast the money-changers "for prophet status, in contrast to Jesus' for-prophet status." I love Brian McLaren's asking, [page 117] "Could it be that just as Hosea in a sense exposed God's betrayed heart ... could God be saying, not just with Hosea, 'You're breaking my heart!' but also through Jesus, 'You're torturing me, killing me.'"? McLaren continues by asking, "How different this gripping understanding of the passion of Jesus is from the formulaic transactional understanding promoted by evangelical pop-atonement theology. ... How must God feel about ... our continuing betrayal of God's heart, our ongoing missing of the point that might be funny if it weren't so sick?" I highly recommend this book as a teaching and discussion resource; it could be helpful as part of the preaching enterprise, as well. But not including a single currently practicing Roman Catholic troubles me and I particularly consider the omission of a contributor writing from a Lutheran perspective both glaring and puzzling, especially given how central the theology of Martin Luther has been for the Church in the West and given that most of his theology was very specifically "Theology of the Cross." In fact, for Luther, the cross of Calvary formed a Weltanschauung, an all-encompassing worldview. The cross of Calvary forms the ultimate type and reality of God’s characteristically hidden and paradoxical, sacramental presence in the commonest things, situations and people. Especially in the cross we learn God totally subverts evil for good, as the death of Jesus Christ becomes a redemptive reality for all creation. Theologians of the cross build their theology in the light of God’s own revelation of himself, particularly God’s self-revelation in Christ crucified. The cross of Calvary forms a paradigm and model for God’s characteristically hidden and paradoxical, sacramental presence in the commonest things, situations and people. my amazon review: "a helpful resource despite serious omissions"
Intersting thoughts on book. I need to add this one to my "library."